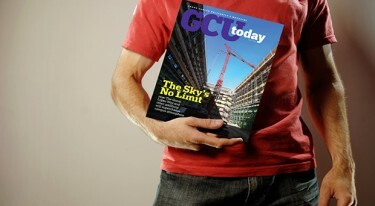 The cover story in the latest edition of GCU Today Magazine is your guide to construction projects on campus this spring and summer. It includes details about new residence halls, dining options and outdoor spaces, such as eating areas and the soccer stadium, plus an update on the engineering building. The May issue also has a story about expanded University tutoring, an article about the bright future of Lopes baseball, and a feature about twin graduating seniors who acted their hearts out in the College of Fine Arts and Production. Other content includes the progress of GCU’s Integration of Faith, Learning and Work, the community calling of online student Tom Granado, the blessings of alumni Drs. Nicole and Brent Nedella at home and abroad, and the Top 10 stories of 2014-15, plus alumni class notes.